Santiago Del Teide Town hall together with the Tourist Board of Tenerife and the Canarian Government are organising a Tapas competition in the Municipality of Santiago Del Teide 2008. This is the first time a competition of this type has been organised. 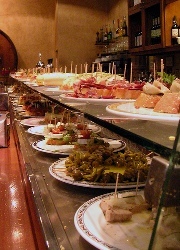 The Tapas route competition 2008 will start from 1st August until 10 august 2008. Be visited by the judges, and the public. Each Tapa must not cost more than 2 Euros, the name of the Tapa must be displayed. The results and winners will be announced on the 26th August 10.00 at a press meeting.